Certainly not the first supposed leaked image of the upcoming Samsung Galaxy S III that has come our way, but we thought we’d share this with you since a lot of the pieces check out, like typeface, timing, location and last but not least the handset has a very interesting design that we’ve never seen before. The device looks like a curvy slab of metal with a large display and practically zero left and right bezel — the zero bezel for the Galaxy S III has been one of the longest standing rumors and something we would be very happy about. There are also no hardware buttons, similar to the Galaxy Nexus (check out our full review here), and a feature of handsets designed with Android Ice Cream Sandwich in mind. The device certainly looks premium enough to merit its place in the incredibly successful Galaxy S series. Now we’ve seen that May 22nd date before in a previous leak that proved to be a fake, but the timing seems reasonable. Remember that Samsung is a major sponsor of the London 2012 Olympic Torch Relay and the Olympic flame will be landing in London on May 18 and touring the UK until the Summer Olympics opening. The only thing that makes us skeptical is the concept that Samsung would have created such marketing material and so far in advance. When Samsung held previous release events they were made under the Unpacked event umbrella and press invites only included a box with the name of the city and date, like the one here. So this could be another fake leak just to keep us on our toes. What do you think? In other news, the Galaxy S III has also been tipped to be sporting a non-PenTile Matrix 720p HD AMOLED display. That would make it the first ‘Super AMOLED Plus HD’ screen. The Galaxy Nexus, has a 720p PenTile AMOLED display, whereby a pixel shares subpixels with its neighbors, this reduces the effective pixel density of the screen. 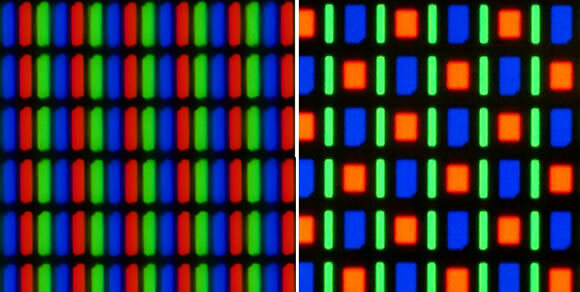 A Super AMOLED Plus HD screen with every pixel having individual red, green and blue subpixels would be certainly be an improvement. Let’s just hope that Samsung also fixes the white balance and color accuracy of its AMOLED screens. Samsung Galaxy S III rumors weekend overview: hands-on video, specs and did Amazon Germany spill the beans? 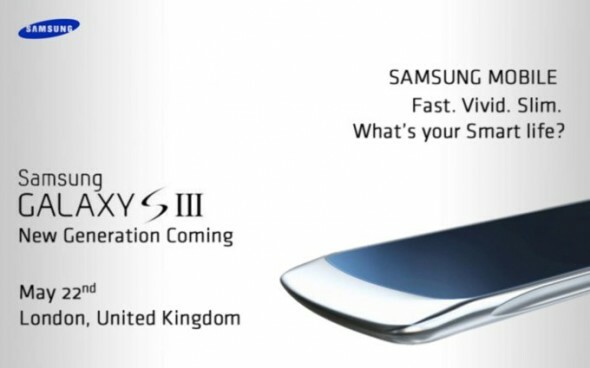 The pieces fit, could this finally be the Samsung Galaxy S III getting ready for a May 22 announcement?